Home » Game Reviews » Assembly: You Survived the Deadly Space Virus, But Can You Survive the Computer and Escape? Assembly: You Survived the Deadly Space Virus, But Can You Survive the Computer and Escape? Written by: KristaG on May 27, 2018. Ah, space…so many opportunities and discoveries waiting to be made in such a vast expanse. Aliens? Other habitable planets? New knowledge to create advances in our technology? All quite possible! However, there are also other things lurking out there among the stars. Viruses, for example. Viruses so deadly that they have managed to exterminate almost the entire crew on board the space station where you work as a ship assembler – yet you have proven to be immune! Are you alone or is there any possibility someone else may share your immunity? Though you’ve survived the virus, can you survive (and escape) the onboard computer system that seems determined to eradicate every living thing on board by venting out the air? Test your odds in Assembly, which is currently live on Kickstarter.com! 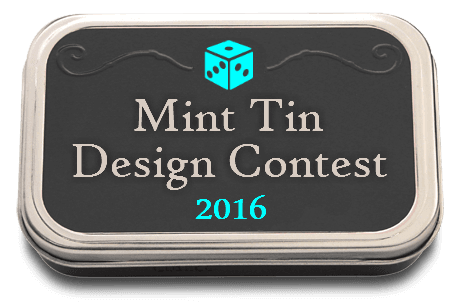 The logo for the 2016 BGG Mint Tin Design Contest. 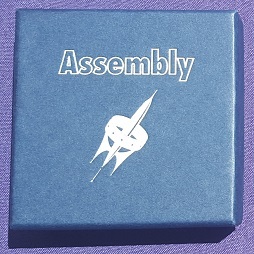 Assembly is a 1-2 player co-operative card game designed by Janice and Stu Turner of Wren Games. It was originally designed as an entry for the 2016 BGG Mint Tin Design Contest, which, on top of being a unique experience for this reviewer, means it is very portable and also takes up very little space on both your table and your shelf! Since Assembly originated as a game that could fit in a mint tin, you’ll notice that all of the prototype photos in this review show the cards as being mini sized. This is something that has changed in the Kickstarter! The small, or “travel version” is still available, however, as part of a higher pledge level during the campaign if you are determined to have a copy with the smaller cards. Assembly also features artwork from Janice Turner and Mike Jessup as well as graphics from the following websites: Freepik.com, game-icons.net, and thenounproject.com. Setting up for a 2-player game of Assembly! One of the things that I really like about Assembly right off the bat is its set up. The play area is actually set up like a clock (Bay Number Card 12 at the top, 6 at the bottom, etc.) with either all Malfunction sides face up or face down – Malfunctions are an optional mechanic and it is recommended by both the designers and myself that players don’t use them for their first game. Next, the Bay Cards are shuffled and dealt “unlocked” side up starting in Bay 12 and going around in a clockwise (left) direction until all Bay Number Cards are filled. After shuffling and stacking the wooden Room Module Tokens, the included d12 is rolled to determine which Bay the first token is going to be placed in. The rest of the Module tokens will be placed during the game itself, so make sure you keep them within reach of everyone playing! 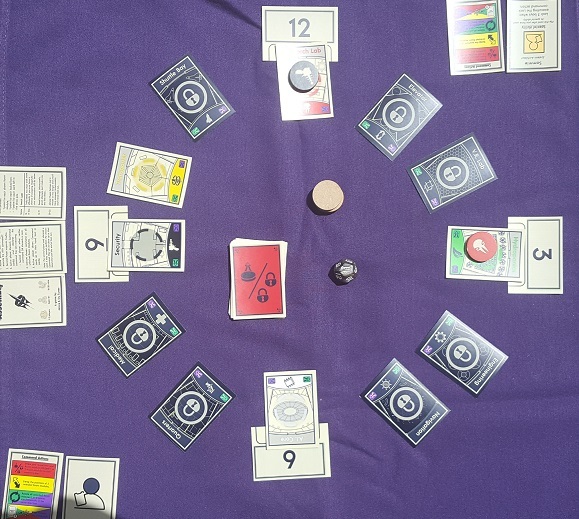 The Command Card deck is then shuffled and placed nearby, with each player drawing 3 cards face down. It is extremely important that these cards are kept secret from the other player! Each player will also receive a Role Card either by choice or at random. There are 6 Role Cards available in the base game as of the time of this review, but the Glitch expansion adds an additional card and there is potential for more to be added with the campaign! These Role Cards all have a single use ability affiliated with them that may or may not be used on the active player’s turn. As each role is different, its impact on the game is also very different, but there are no roles that are “solo player” specific, which is also awesome! At the end of our game, we managed to only score 16 points… We lost, but still had a really good time! How Assembly is played varies somewhat on the number of players, which of the included variants is being used as well as if players have opted to play with Malfunctions and/or the mini-expansion; “Glitch.” In solo play, for example, the order of play is slightly simplified. Typically, however, the game is played over a series of turns comprised of various steps (3 different steps for solo, technically 7 for co-op). Though this sounds complicated, it really isn’t. First and foremost, the active player must choose a Command card from their hand that they wish to try to execute. If playing with 2-players, there are a few extra steps involved in verifying if the command can or can not be accomplished, but those are explained much more in-depth in the rules. Once that is done, the command is executed with any consequent effects applied (such as moving or “rotating” the Room Module tokens to different Bays). 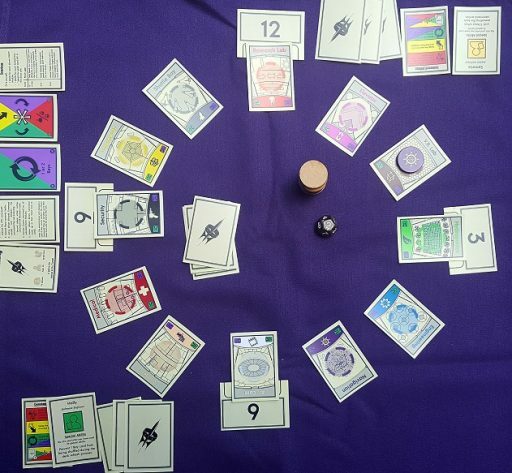 Then, at the end of the turn, the player will draw back up to their hand limit of 3. At no point in the game, however, should players reveal to each other what cards are in their hand or give away which command they intend to perform on a future turn. The really cool thing about this is how communication works between players. Assembly is meant to be played with both limited information and limited communication, but just how limited that communication is is determined by the group. There are 3 possible ways to choose from. The first is with limited information, but open communication about win strategies and similar topics up until the moment a verification question has been asked, which will cause all communication to cease for that turn. Next is limited information, reduced communication, which allows players to discuss general strategies, but communication will cease this time once a command word is said (even if said as part of a strategy!). Lastly, and my favorite method, is with limited information and limited communication! If using this method, players must speak only with sign language and/or hand gestures! These can be actual signs (such as from NASL, ASL, or BSL) or gestures that are agreed upon by the players before playing! The game is played until either all Bays are properly locked (and Malfunctions are resolved) or the Command deck has already been refreshed twice and players can no longer draw a Command card when needed (meaning: the deck is played through 3 times total). If the Bays are locked, players successfully escape by reaching the ship and can jettison themselves from the space station. Otherwise, the players fail to escape and they perish. However, win or lose, there is still some scoring to be done at the end! There are so many things to say about this game! Though Assembly seems to fall into the niche category of deduction and hidden information games like R&R‘s Hanabi or IDW Games‘ Purrrlock Holmes: Furriarty’s Trail, it also stands completely apart and carves it’s own path. There is such a flawless blend of mechanics that make up the game that it seems to be in a category all on its own and is sure to be a hit at all of my game nights. Though the artwork is very simple, that makes it perfect for this type of game and it makes it so that it is playable by practically anyone! Younger players can learn by just trying to match up the symbols on the Module Tokens with those on the Bay Cards or they can learn by matching the colors. Being able to read, unless using Malfunctions, isn’t required to play. Being required to speak or hear isn’t even required to play due to the possible limitations on communication between players! I also really like the fact that this is a true co-op for 2 players as many of the 2-player games out there are much more head to head dueling type games. Yet, Assembly is also still playable as a solo game and provides a very different experience depending on how many players you have. If you or someone you know likes puzzles, is interested in space themes, likes programming mechanics, or is someone who just wants to try something different and test their communication skills and teamwork abilities, I highly recommend checking out the Kickstarter campaign as this is a game that I can honestly say I love everything about it – the replayability; the wonderful quality of the wooden tokens; the game play; the exhilaration that comes with trying to beat the clock; learning to communicate differently and more effectively with my fellow players; literally everything!